Scientists have never paused their quest to understand our skin and how to slow or stop the signs of ageing. Combining scientific efficacy with skincare that feels comfortable, BIOEFFECT are at the very forefront of skincare innovation. BIOEFFECT aims to harness your skin’s natural ability to repair and restore and proliferate skin cells, with a formula rich in molecules that can signal to your body to regrow. BIOEFFECT SERUM is a groundbreaking innovation in skincare, as it contains human-like cellular activators made in plants. Created by two Nobel Prize winners, this medical breakthrough in skin regeneration has been captured in a simple, effective serum. After years of hard work and tireless research, a plant-based replica of a human cell promoter was developed. Barley grows swift and strong, and has a genetic code that works well on the skin and is safe, pure, and very effective. Inspired by an ingredient that has been used to speed the recovery time of burn victims, and to encourage wound recovery, BIOEFFECT use a specific type of natural barley that is grown in a carbon-emissions free greenhouse, using the nutrient-rich soul from inert volcanic pumice. This restorative serum helps to remind your skin of how it used to function, helping it to recover radiance, structure, tone and density. 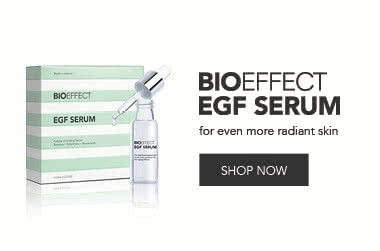 BIOEFFECT SERUM also helps your boost, and hold its natural levels of water. Not only does this leave your skin looking more healthy and radiant, but also helps your skin to defend itself from environmental aggressors. BIOEFFECT Serum is perfectly skin-safe and perfect for use once or twice a day under a moisturiser. BIOEFFECT SERUM leaves you with a healthier and fresher appearance and moisturises, while at the same time inhibiting signs of ageing skin. BIOEFFECT rely on remarkably pure formulations. For instance, you can expect to see upwards of 30 ingredients in most popular skincare alternatives - but BIOEFFECT only needs 7 ingredients in its serum to produce noticeable results over time. I honestly love this. I got a sample and used it for a few days and saw a huge difference. Would reccomend if you have the money to spend, it is quite pricey! I really like this product as I noticed a difference on my puffy eyes immediately afterwards. I used it in conjunction with an eye cream. Not all masks are for puffy eyes so this one is specific. It does its job after needling, but doesn’t make my skin look better at all. It definitely helps with the recovery time after needling, I can barely notice damage on my face the day after, but for the price it should be amazing but is not, and its also oily. I would recommend to anyone for micro needling recovery.